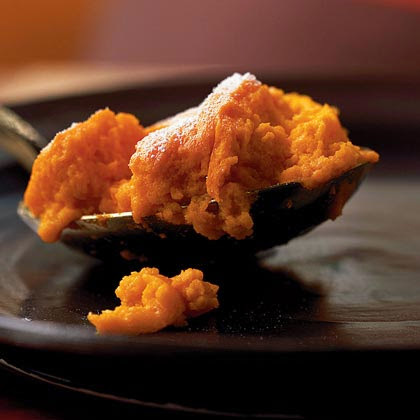 My mother mentioned she had a wonderful Carrot Soufflé over the weekend and I had to dig out this recipe from Cooking Light and share it with you today. I love roasted carrots and now that it's officially fall, a carrot soufflé is the perfect dish to serve as a side to roasted chicken or pork. This recipe is really more of a casserole than a traditional soufflé, since it doesn't contain beaten egg whites. Click here for the recipe. Note: This recipe calls for boiling the carrots and I prefer to roast them at 400° for 45 minutes as this brings out a sweeter, more caramelized flavor. I also use turbinado sugar instead of white sugar as I love the caramel / molasses flavor it adds. I also love to use individual ramekins instead of a large soufflé dish. Makes for a great presentation on the plate! This would be wonderful served with the Herbed Roasted Chicken recipe I shared a couple of weeks ago!